One problem we have this year which we didn't really have last year is condensation. We have a much tighter seal this year on Cygnet including taping the air vents for the engine compartment, taping or plugging up the bathroom fan vents, and better sealing the windows. Because of this there are areas of the boat where the warm and moist air from the interior is meeting cold areas of the fiberglass that touch or come very close to touching the water outside. This is making a fairly thick layer of condensation on this fiberglass, kind of like a glass of ice water on a steamy summer day. The hanging closet in the forward bedroom, the hanging closet in the aft bedroom, the bathroom under sink cabinets, and some of the drawers below the dinette are experiencing this. Last month we cleaned all the junk out of the forward closet and have a small fan going with the door slightly ajar and it helps a lot. The cabinets under the bathroom sinks are ok, we just keep an eye on them, but the drawers under the dinette are a concern. We keep lots of occasional use stuff, some electronics, and tools in them and the bottoms of some of the drawers touch the hull of the boat and are soaking through since they are fiberboard. Colette took all the junk out of one drawer this weekend to let it dry out, but now all that junk is sitting out and we don't expect to be able to put it back in for a couple months. We think that not sealing the engine vents last year stopped this issue because the cold and dry outside air was able to exchange with the humid inside air and dry out these spots. We don't want mold to develop so we might take some of the tape off the vents to allow an air exchange. Maybe we'll wait until after this week though since warmth is hard to keep below 20 degrees. The biggest news we had this past month is a visit from Colette's brother (more on this in the next post). He's a great guy from the San Francisco area and has visited us in the past when we had our house. What makes it a bit more difficult when he visits is that he's in a wheelchair. He is able to walk, a bit, but not very far or with a lot of control so we knew our side steps were not up to the task of getting him on and off the boat. Kevin decided a bridge was the solution. This isn't an original idea, one of the other boats on our dock already has one, and our neighbor who used to have an identical Carver had one. Kevin decided to just copy the design of the bridge on the other boat in the marina since the owner is an engineer and did a very nice job - why reinvent the wheel, right? We knew the zipper doors (like on a tent) that most people use was not going to be ideal so a platform and door would have to be made. It took two days and a fair amount of sweat equity but Kevin got the bridge and door to all work the way they are intended. The bridge has to articulate and is on wheels due to the change of the water level and movement of the boat. The door had to be made from scratch to fit the 19 inch wide opening that Carver designed in the wall of the aft deck. The plastic wrap is there to keep the vestibule clean and snow free, but this picture was taken before Cygnet was wrapped so now the wrap meets the front of the vestibule for extra protection. The door is on spring hinges so it closes on its own and can be latched and even locked from the inside. In order to open the latch from the outside Kevin drilled a small hole in the frame and ran a string through it that pulls the latch up when you need to get in. The bottle opener door pull on the outside (shadow near the latch) didn't make it very long. The photo above shows the plastic on the outside of the windows and the support to keep the wrap from closing off the bow. We need access to the bow to pump out the tanks and refill the fresh water and last year it was very tight, Kevin needed to crawl along the side to get up there. This year it's much easier. We also feel wrapping the plastic around the outside of the windows is better than the clear wrap we put on the inside last year. The wrap from last year is what people in cold climates use on their house windows to keep drafts out. You put double stick tape around the window, stick the plastic up, then use a hairdryer and shrink wrap it to keep it tight and clear. It was a lot of work but it kept the view in tact, although most of the winter the view was of the inside of the wrap. This year we used thicker plastic and Dr. Shrink tape to seal everything from the outside which took much less time, cost about the same, and does a much better job of sealing out the winds. We also learned not to put the double stick tape on the fiberglass last year since it took both of us hours to clean the residue off with Goo Gone, fiberglass polishing compound, and wax. Don't do that! Dr. Shrink tape is designed to stick well to fiberglass through the winter and come off cleanly in the spring, it's the standard of the industry for wrapping boats and seems to work incredibly well for us. So Water We Thinking about the winter of 2015/16 so far? Well it's been mild and we've had very little snow. Cygnet is holding up well and we are keeping warm. 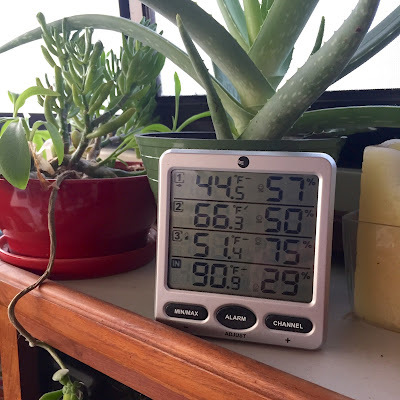 This past weekend we had sunny skies and temperatures of almost 50 degrees and while we were out the heaters stayed on and we returned to a 90 degree interior! Winter is half over and with the exception of this week the temps should be going nowhere but up. It's looking like an early spring. Thanks for perfecting the door before coming over and helping me with mine!